Welcome to the third Coin Report. In today’s report, I’ll be examining in exhaustive detail the fundamental and technical strengths and weaknesses of Covesting, concluding with a grading of the project and its upside potential. And when I say ‘exhaustive’, I mean it. The previous two reports on GeoCoin and ALQO ran for ~4,000 words and ~5,000 words, respectively; this report may run for 6,000. I hope you’ll find some degree of insight in it. Covesting is one of only three ICOs I have ever invested in. The entire concept of an ICO has always felt a little worrying to me as a speculator, and this was particularly the case during the ICO boom of summer 2017. Projects were raising hundreds of millions of dollars with no working products, dubious credentials and little-to-no innovation or viable use-case. And when you’ve raised $100m or more, where is the incentive to work? That was the primary reason for me steering well clear of ICOs and sticking to the near-zero or zero premine Proof-of-Work and Proof-of-Stake projects for the majority of 2017. Further, a lot of the ideas conceptualised and developed by ICO projects were also being explored by non-ICO projects, so there seemed to me to be no real advantage for the purposes of speculation; the reward-to-risk was greater for the more traditional coin launches. However, in late November or early December 2017, I came across www.covesting.io. On the website, I found details of an imminent ICO for a copy-trading platform by the name of Covesting. Up until this point, I was unaware of any copy-trading platform for cryptocurrencies, but I knew that many in the space (myself included) used 1Broker for copy-trading BTC/USD, forex and commodities. There was a clear gap in the market, and I had been waiting for something similar to 1Broker to come along for altcoins, specifically. What I gleaned in my first impressions of Covesting was the potential for a far superior and more comprehensive, feature-rich platform than that of 1Broker. The thing that worried me was the ICO; but I knew that non-ICO projects weren’t working on copy-trading, possibly because of the capital-intensive nature of building a trading platform. Anyway, I was interested, and so I read the whitepaper to get some more details on the ICO (details I will go into later in the report). Long story short, Covesting was only looking to raise a maximum of ~$12.5mn at the time, with a 25,000 ETH hard cap. This was significantly lower than the vast majority of the ICOs I had seen, and the fact that only 13% of the tokens created were going to the team cemented my confidence in the project. There were Proof-of-Work coins launching with larger premines than 13%, and most ICOs were dishing out 25% or more of tokens to their founders. So, I bought the ICO at what worked out at roughly 5000 satoshis per COV, and I’ve been buying more over the past two months. That’s enough back-story. Covesting as a project has innumerable points-of-interest for those of us looking for low risk, high reward opportunities in this space, and I hope that this report proves thorough and objective in establishing the project’s strengths and weaknesses. Covesting was launched in November 2017, with its ICO selling out in its entirety on December 31st 2017. It launched, as with the vast majority of ICOs, as an ERC-20 token, and happened to get its first exchange listing when the entire market peaked in January, and, as such, has suffered a downtrend in price for the best part of its existence. We’ll dive into the limited price-history in more depth in the Technical section, but for now it is important to note that Covesting is yet to experience a full market cycle. Below are listed a number of significant metrics that will be analysed at the end of this section. Firstly, it is important to note that metrics are dynamic, and this information is accurate as of 4th November 2018. Secondly, if any of the recurring terms in these reports are unfamiliar, you can find brief explanations in the opening paragraph of this section on the first Coin Report I wrote. Lastly, the rich-list was examined using https://etherscan.io/token/0xe2fb6529ef566a080e6d23de0bd351311087d567#balances. Though the lack of staking or masternode functionality, and the fact that the maximum supply has already been minted, means that this section is a little less stacked than that of ALQO, there is still a lot of important information to look at. The Covesting whitepaper states that COV will serve as the fuel for the Covesting platform, making it, in essence, a utility token. In doing so, its value will be tied to demand for use of the platform. As such, which of the above metrics are most significant? Well, the greatest metric to determine the strength of COV would be the volume being traded on the Covesting platform, but, until the fully-functional public release comes out later this year, we’ve little to go on. There are, however, many points-of-interest for those of us looking to turn a profit on COV, particularly at its present price. Let’s begin with the General metrics, before moving on to discuss the lack of supply emission and the distribution of the token. One of the primary means of determining interest is studying the volume traded, both Exchange Volume and Transactional Volume. Covesting traded ~$93k in the last 24 hours, or 0.64% of its Network Value. As expressed in my article on Picking Out Microcaps, I tend to prefer when Exchange Volume-to-Network Value is above 1%, as a sign of smart-money interest, but given that we are currently in a bear market, such figures are unlikely to be the norm. (Also, Covesting is not a microcap; it’s a midcap.) In my previous two reports, these figures were 0.24% and 0.28% for ALQO and GeoCoin, respectively. Covesting is trading at well over double these levels. Promising. Now, if we take a look at the Average Exchange Volume, which is measured over the course of a month, we get a lower figure of ~$52k, or 0.36% AVNV. Comparing this with ALQO’s 0.18% and Geocoin’s 0.13%, we once again find relative strength in COV. However, given that Covesting is listed on KuCoin and HitBTC (two of the larger exchanges in the space), I am a little disappointed that it isn’t hitting ~0.5% or greater AVNV. But, all things considered, there certainly seems to be some interest, and this is something we will later confirm in analysis of the rich-list. Now, if we turn to Average Price, we find that COV has traded at an average of $0.70 for the past 30 days, and is currently trading ~20% above that. This tells us that Covesting was possibly being accumulated around $0.70, and that the uptick in volume recently has brought with it the beginnings of a reversal. Perhaps the strongest figure amongst that list of metrics is that of % Max. Supply Minted. Covesting being an ERC-20 token that launched with an ICO, this figure is 100%. That means zero supply emission post-launch, and thus zero inflation. One of the most common pitfalls I see in the space is the complete disregard of inflation when considering the price at which one should enter a position. Too often do you find faux-opportunities where everything is lined up technically for an entry, but the price you think you’re paying isn’t really the price you pay. This is due to excessive short-term supply emission – a high inflation rate – that generates strong headwinds to push back price growth. Just look at ZCash, for example. The one advantage that the majority of ERC-20 ICOs have for us, as speculators, is that they have zero inflation post-launch. No need to worry about mass supply being dumped on the market on a daily basis with potentially too little demand to maintain current prices. Returning to COV, what this also allows us to determine is the level of demand. As there is no more COV coming onto the market, if the current level of volume traded was unable to sustain prices, we would know that this is due to falling speculative interest; not because miners or stakers are dumping their rewards. In Covesting’s case, not only has price been maintained over the previous month, but it is beginning to pick up. Further, if we look at the Liquidity figure of 4.61 BTC, or 0.2% of Network Value, we find that demand at current prices seems to be greater than that of ALQO and GeoCoin, which exhibited 0.12% and 0.18% Liqudity, respectively. Concerning NVT, Covesting scores 361.03, with ~$40k of Transactional Volume in the past day. Over the past week, Covesting has an Average NVT of 1949.43, with Average Transactional Volume of $7,498. Now, until copy-trading launches on the Covesting platform and COV begins to be transacted for its primary purpose and to its full extent, these figures are to be taken with a pinch of salt. However, it is interesting that in the past 24 hours, COV has experienced over 5x greater Transactional Volume than it has averaged over the past week. With that greater Transactional Volume, we have seen increased prices. Perhaps a sign of things to come when the platform is publically launched and COV takes on the function of its design? Moving onto the last couple of points-of-interest in the General metrics, I found it intriguing that Covesting is currently trading around -63% from its all-time high of $2.38 (according to CoinGecko). This has both positive and negative connotations regarding profit potential. Firstly, the vast majority of altcoins are trading well below -90% of their all-time highs at present, even with the recent signs of reversal. At its lowest, Covesting traded at -76% of its all-time high. This shows strength via the genuine demand for the token, even at the deepest, bloodiest period of the current bear market; even when Ethereum itself had lost 78% of its value against BTC. Very promising. However, the risk that this brings with it is that we pay a higher price for entry, and calculable upside potential (a move back to the all-time high) is diminished. What is great about buying coins at 96% below their all-time highs is that the reward-to-risk is so high, providing the fundamentals are sound. With Covesting, we find genuine demand for the token at the worst of times, but for that we must risk paying more. How I think this plays out, however, drawing back to something I said earlier about the limited price-history, is that there is a great deal of price discovery to be experienced above and beyond the all-time high, particularly upon successful launch of the platform and the arrival of a new bull cycle for the market. That being said, calculable upside potential puts us at around 130% given an entry at current prices. Price is currently 47% above the all-time low. This gives a calculable reward-to-risk ratio (if the position was to be sold at break of the all-time low) of 2.76. It could be better, it could be worse. Personally, I believe the upside potential to be much greater than that which we can view from Covesting’s price-history, for reasons that I’ll delve into in later sections. Before we get onto more abstract fundamentals, let’s do some distribution analysis. Covesting currently has 10189 holders. If all of those end up users of the platform, we could be in for a treat. For comparitive purposes, Genesis Vision and Blockport (two potential competitors) have 7237 and 11849 holders, respectively. Covesting is well ahead of Genesis Vision – despite COV having a Network Value of around a third of GVT – and around 17% below Blockport, despite having a Network Value around 2.5x that of BPT. Based on this comparison alone, this would place Genesis Vision as highly overvalued, Covesting as reasonably valued, and Blockport as undervalued. Returning to analysis of Covesting, specifically, the supply seems fairly well distributed, if you account for the founders’ 12.5% (essentially a premine). Not accounting for that 12.5%, the distribution is as follows: 33.08% of COV held by the top 10; 38.79% held by the top 20; and 54.21% held by the top 100. You can just subtract 12.5% from those figures if you want distribution figures accounting for the founders’ reward. Either way, it’s not poorly distributed. There are certainly signs of accumulation amongst the top 10 and top 20, as they control around a third of the supply, but a little under half the supply is distributed outside of the top 100 addresses. Of the top 20 addresses, 12 have been inactive for the past 30 days; they are neither accumulating or distributing COV at present. Of the other 8 addresses, only the 12th-richest is distributing, and the distribution over the past 30 days accounts for less than 1% of the total balance. The rest are primarily micro-buying. Further, the 12.5% founders’ reward remains untouched. This, to me, indicates that the majority of the top 20 are content with their positions, though there is some active accumulation at current prices from a few. I look forward to monitoring any changes as price rises. That concludes my analysis of the metrics. Onto the Covesting community. In the previous two reports, I referred to RivalIQ’s social engagement benchmarks. Let’s look at how Covesting fares in this regard: firstly, Covesting’s Average Twitter Engagement is 0.79%. This is 17x greater than the average engagement rate across industries, and almost 61x greater than that of the Media industry. Going back to previous reports, Covesting has an average engagement rate on Twitter around two-thirds of that of ALQO but over 4x greater than that of GeoCoin. Where both those coins failed, however, was on Facebook. Covesting has no such failure, publishing at a rate of almost a post a day for the past month, with 20,885 Likes and an Average Facebook Engagement rate of 0.16%. This is the exact average engagement rate across industries for 2018, and double the average engagement rate of the Media industry. Moving onto Covesting’s Telegram group, the project boasts 7661 members (around 5x ALQO’s group size). Having spent some time evaluating the level and depth of discussion occuring, there seems to be hundreds of daily messages between members, with the group conversing almost 24/7. Much of he conversation centres around excitement for the public release of the platform, which is good to see, and the remainder comprises of support questions being swiftly answered. 5 out of 5. The BitcoinTalk thread was created December 28th, 2017; a few days before the conclusion of the ICO. It has since generated 42 pages of discussion, and 822 individual posts. Over the past 90 days, there have been 64 posts by 23 individual posters; a post-to-poster ratio of 2.78. There is less recent discussion on the thread than in the ALQO or GeoCoin threads, which generated 140 and 94 posts for the preceding 90-day period from which those reports were published. However, the discussion is inquisitive, and queries are responded to quickly and informatively. There are a lot of consistent development updates being pushed out, also, with relevant links to lengthier, more thorough updates via the Covesting Medium blog. One thing I did spot that was a little fishy was the appearance of multiple posts with similar messages, all from new accounts. This is likely someone invested who is attempting to articificially generate enthusiasm about the project. All-in-all, my impression of the Covesting community is that it is a large one with genuine interest towards the future of the project, in particular the release of the platform. Many seem to be itching to copy-trade altcoins. For the following Development analysis, I will be evaluating project leadership, the website, the roadmap, the whitepaper and finally providing a general overview. No wallet evaluation is required as Covesting is an ERC-20 token, and can be stored in the plethora of Ethereum wallets. The Covesting team is potentially the greatest asset to the project, and certainly one of its fundamental strengths. The executive team comprises of 3 heavily-experienced professionals: Dmitrij Pruglo – an ex-Saxo Bank trader and Covesting’s CEO; Tim Voronin – an early adopter of Bitcoin, a prop trader with over a decade of experience and Covesting’s COO; and Kurt Carlsson – an ex-Executive Director of Saxo Bank with over 25 years of experience and Covesting’s CCO. The executive team certainly has the experience and credibility required for the successful development and launch of a copy-trading platform. Further, there are 18 employees listed on Covesting’s LinkedIn, though 25+ employees are reported to be on the team on the website. 40+ employees are reported to be on the team in the October Review published by Covesting recently. Lastly, there are 8 vacancies listed on the website in an array of roles. I really like that the Covesting team continues to expand; and the depth and breadth of knowledge and experience seems sufficient for the ambitions of the project. Very promising. Covesting.io is informative and easy to navigate. I particularly like that there is a dedicated blog with regular, long-form updates. The Crypto Intelligence portal is very useful, acting as, as stated in the whitepaper, a “Bloomberg terminal” for cryptocurrencies. There are social features, an altcoin screener, integrated TradingView charts and a regularly updated newsfeed. Further, there are free courses on trading for beginners and blockchain basics in their Academy. This all serves, in my opinion, to increase accessibility and ultimately the utility of the project for end-users. The platform itself (ref link, if you’d care to use it), though not fully launched yet, is smooth and well-designed. It is feature-rich, providing reports of all sorts, messaging and chat functionality, a dashboard with easy portfolio tracking and performance measurement and integrated TradingView charts for the exchange. I very much look forward to trying it out when it is fully-functional. There is no dedicated and permanent roadmap to be found on the Covesting website, but there are abstract forms of one that appear in blog updates and in the whitepaper itself. In this recent post, you can find a run-through of present and future goals. It seems the project was running a little late on deadlines, but this can be forgiven as much of the roadmap hinged on the issuance of a DLT License. This license was recently issued, around Covesting’s 1st birthday. Looking at the roadmap provided, the Beta launch of the platform was achieved on time, and the trading competition they hosted recently ended. Further, KYC integration is complete. A referral program has recently been launched with the imminent arrival of the public release of this platform. (You can sign up either using my ref link or via https://covesting.io/exchange.) According to the roadmap, this launch will be followed by initialisation of copy-trading functionality a month later, so that there is some trading history. 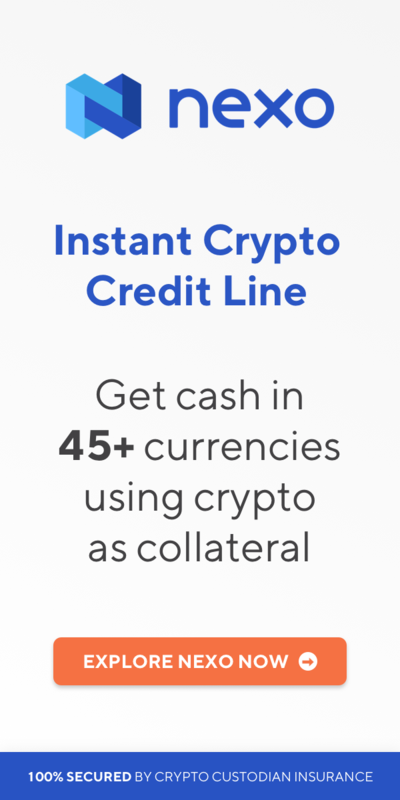 Lastly, the buy-back program (which we’ll discuss at length later) will be launching this quarter alongside fiat gateways. Overall, the actual goals and targets of the roadmap are excellent, and they create a great deal of excitement about the potential of the project. However, I would have liked to have seen a dedicated roadmap on the website with specific and clearly delineated goals in a visually appealling manner. The website is the first point-of-reference for many new users, and this would ensure ease-of-access. The Covesting whitepaper seems to be written a little like an Annual Report by a publicly-traded company, minus the balance sheets. It’s no surprise given the background of the team. The material is mostly professional but there are grammatical errors here and there; proofreading should have been done to a greater degree. However, this doesn’t detract from the jargon-and-buzzword-free prose that pervades most ICO whitepapers. The first point-of-interest for me comes in the clear explanation of the benefits of aggregrated liquidity, which will be a feature of the Covesting platform. Aggregated liquidity will ensure the best possible prices for traders and will remove the necessity for multiple exchange accounts. That’s a plus in my book. Next, the whitepaper states that the Covesting platform will provide 24/7 live support. This, for me, is a big tick, as exchange support in this space is notoriously poor. If Covesting can deliver on this promise, that alone would distinguish the platform from the competition. Moving on, I like that the goal of the project is clearly depicted: Covesting, in essence, would like to be a one-stop comprehensive ecosystem for crypto-traders. to others directly. Fully peer-to-peer. The financials for copy-trading break down as follows: 18% of followers’ profits are given to traders (this is the success fee); the platform takes 10% as commission; end-users take the remaining 72% as their profits. All profits are given in COV. Concerning the ICO, the details are made transparent: 12.5% of 20mn COV tokens (2.5mn) go to the team; 75% is distributed via public ICO; and the remainder is distributed via pre-ICO, marketing, bounties and advisors. One point to highlight is that, for an ICO, this is a very small portion of tokens being given to the team. Further, proceeds of the ICO are stated to be distributed as follows: 40% to R&D; 25% to marketing and acquisition; 30% to capital expenses; and 5% to legal fees. You can find further info in the document. Lastly, the use-cases clearly of the token itself are outlined: COV is used to copy-trade and any profits are returned in COV. 50% of revenue generated by the Covesting platform will then perpetually be used in a buy-back-and-burn mechanism, reducing the circulating supply over time. We will go into more detail on how I think this plays out in a later section. Overall, the whitepaper is highly detailed and thorough, with visuals that ensure accessibility, but perhaps it needs an update given the past twelve months of progress and change. 5 out of 5 (just about – I’m forgiving the grammatical errors). Generally speaking, there is a lot going on at the present time for Covesting. They’ve recently achieved some of their significant goals, such as the Beta release of the platform, hosting their trading competition, the launch of their iOS app, and, most critically, the issuance of their DLT License. Moving forward, if Covesting can maintain this professional approach, it can only get better. They have their public platform release this quarter, which will bring with it copy-trading functionality and the buy-back-and-burn scheme. Also, they’re planning on an Android app release soon. Looking much further ahead, the goals don’t get any smaller: there is talk of derivatives being launched; algorithmic trading; and a global marketing campaign focused on institutional investment. I mean, the distingushing feature of the project is, of course, the DLT License. This is what sets Covesting apart from its competitors. Perhaps there is good reason why the 1st result on Google for a search of “crypto copy-trading” is the Covesting website. I look forward to seeing the next few months unfold. Regarding the funding structure of the whole project, it seems to me their revenue is presently set to comprise of trading fees, deposit fees and copy-trading commission. There is also talk of introducing binary options as another future revenue stream, as well as generating commissions on the trading terminal. Now for some final thoughts on Covesting’s fundamentals, and, more importantly for us, the value of the COV token. If the Covesting platform becomes a top 100 exchange by volume on Coinmarketcap, it will trade, on average, $1.5mn daily. This would equate to $45mn of monthly volume, which would equal $90,000 in trading fees at a 0.2% average fee. 50% of these fees will be used to perpetually buy and burn COV, which would equate to $45,000-worth. At the current price of $0.84, this equals ~53,500 COV bought and burnt monthly, or 0.3% of the circulating supply. If Covesting ends up in the top 50, it will trade, on average, $20mn daily, or $600mn monthly. This would equate to $1.2mn in trading fees at a 0.2% average fee, which would equal $600k in monthly buy-backs. At the current price, this is ~715k COV bought and burnt monthly, or 4.08% of circulating supply. If Covesting ends up a top 20 exchange by trading volume, it will trade $95mn daily. This is $2.85bn of monthly volume, which equals $5.7mn in trading fees at a 0.2% average fee. That equates to $2.85mn monthly buy-backs, which is around 3.39mn COV at current prices, or 19.38% of circulating supply. Now, there are several caveats. Firstly, this is only accounting for trading fees generated; not copy-trading commissions or deposit fees. Secondly, this thought experiment assumes a constant price irrespective of the volume of buy-backs. In practice, this wouldn’t happen, and the liquidity would not be there for such a volume of buy-backs without significantly raising the price of COV. Regardless, it is easy to see how a successful launch of the platform and a future marketing campaign for user acquisition could lead to a dramatically higher value for COV based on buy-backs alone. That concludes my fundamental analysis of Covesting. Onto the technicals. As I mentioned earlier, there is limited price-history for Covesting, as it has only been in existence for a year, and has only been traded for ~10 months. That being said, there are numerous points-of-interest on the chart. Firstly the all-time high was one of the first prices ever traded for COV, which implies a huge amount of potential price discovery were a new bull cycle to begin. 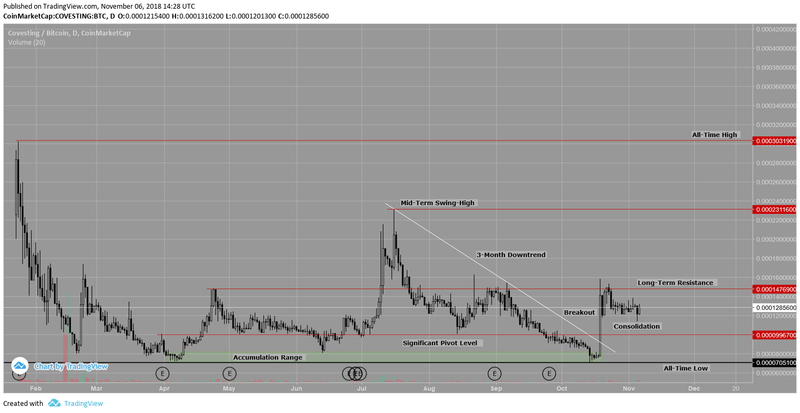 Secondly, the 3-month downtrend was recently broken in explosive fashion on announcement of the DLT License being issued. Price had previously traded back into an area of former accumulation, right at the all-time low. Price has since sustained the breakout, and has consolidated above a significant pivot level (a level that has shifted from support to resistance numerous times) at ~10k satoshis. There is significant long-term resistance around ~15k satoshis, and a close on the Daily above that level would indicate that new highs are incoming. As stated earlier, calculable reward-to-risk of an entry at current prices is 2.76, but I certainly won’t be selling my position at the break of the all-time high. I believe I’ve covered quite a lot of ground in this report, and, having now garnered a better idea of the experience of the team behind Covesting, I’m eagerly anticipating future developments. My final grading for Covesting is a solid 4 out of 5. There is so much fundamental strength that it would be easy for me to grade Covesting a 5, but I am reminded that this is not merely a fundamental report; we are speculators, and thus the technicals, and specifically the reward-to-risk, become a key factor. Please let me know if you’ve enjoyed this third Coin Report; which sections you found most valuable; where you’d like me to develop further/refine/improve etc. And feel free to leave any questions in the Comments section and I’ll get back to you. Oh, and sign up for the mailing list if you want these delivered direct to your inbox! Lastly, I know I mentioned it earlier, but I’d really appreciate it if, if you’re interested in the Covesting platform, you could sign up using my ref link: https://www.covesting.io/?ref=42416. Of course, there’s no obligation to do so, and I hope you’ve enjoyed the report! Went through your coins on the Christmas Wishlist yesterday, and today catching up on all your coin reviews! Excellent work you are compiling, and thank you so much for giving out this info for free. I like the covesting idea and look forward to the platform going live, but a token-model with a more straightforward “return” for investors is something I’m looking for and do not really see in covesting right now. Trade volumes are decreasing for months and competetion is strong with more new exchange tokens listing on CMC than any other token-class. Still, great report and def. a project I am highly interested in. I would love a coin report on GIN, as this particular coin has led me here as it is one I am heavily invested in. Glad you enjoy the reports! I have quite a few other reports in mind over the next couple of months, but the GIN team can always get in touch if they’d like a Sponsored Post to skip that queue! >>As stated earlier, calculable reward-to-risk of an entry at current prices is 2.76, but I certainly won’t be selling my position at the break of the all-time high. Because the all-time high was set when Covesting had made zero progress besides launching their ICO. There was little development or fundamental strength to go on. A year later, quite a lot has happened, and I think there’s a lot of price discovery to be found when we enter a new bull cycle. Hi Nik, great report, as usual! As it is already the 3rd report, I think many of us would find useful if with every new one you could publish a table comparing the metrics of the last coin analyzed with the previous. I was thinking of making that table for myself, but I’m sure you are alredy doing it for your own comparisons. It would be apreciated if you could share it. I can’t wait until your next analysis! Thanks for your good work! Absolutely. In the next report, I’ll provide a link to a Google Sheet with all the data in a table. Great work Nik; appreciate the thorough research, I am actually beginning to understand crypto economics better just from reading the reports. No problem! And I’m glad you’re finding them useful. Great analysis. Really liked various sections covering all aspects end to end and also providing personal opinions.